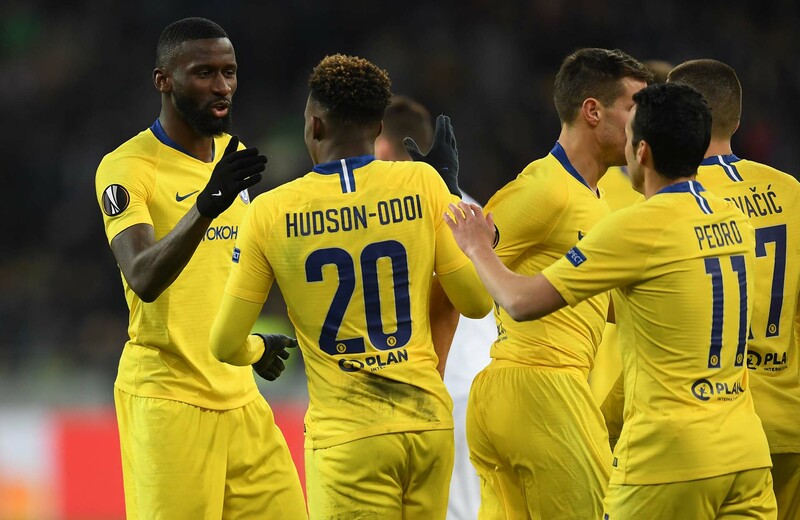 Callum Hudson-Odoi celebrates with teammate Antonio Ruediger after scoring his team's fifth goal during the UEFA Europa League Round of 16 Second Leg match between Dynamo Kyiv and Chelsea at NSC Olimpiyskiy Stadium on March 14, 2019 in Kiev, Ukraine. Youth league progress but the sternest test to date. There was some superb football on display tonight as we slotted together our passing game perfectly. Juan Castillo opened the scoring by snaffling a rebound and Luke McCormick controlled his volley at an awkward height well for the winner. In between we watched as a free-kick sailed effortlessly straight into the net. Progress is progress and we play Dinamo Zagreb in April at Cobham. If we win that one then the finals weekend is later that month in Nyon. Fran Kirby scored a hat-trick and Adelina Engman added the fourth as we totally dominated Liverpool in a league fixture. We are still third in the table and running out of time for both City and Arsenal to slip up. Olivier Giroud scored three, Callum Hudson-Odoi made one for Marcos Alonso and scored the last himself. The most significant performance came from Ruben Loftus-Cheek. The young England midfielder drove Chelsea forward so much more effectively than we have seen from the selection in league games recently. Ruben kept his place in the England squad, along side Ross Barkley. Earlier in the day Hudson-Odoi was drafted into the England U21 squad, where he joins five other Chelsea players. Slavia Prague. The drawn for the next round of the Uefa Cup kept us apart from Napoli and Arsenal and handed us a trip to the Czech capital in the spring. After losing to Arsenal last time out this defeat leaves us 12-points behind the leaders as the academy focuses on the Youth League for the rest of the season. Another insipid performance. Graeme Souness is starting to really hate Maurizio Sarri’s side, he said the Italian had succeeded in turning Chelsea into Arsène Wenger’s Arsenal and it is getting harder to dispute. Here we tippy-tapped through the first-half without really looking like scoring and then folded like a pack of cards in the second. What was most frustrating was the sparkling performances of Ruben Lotus-Cheek, Callum Hudson-Odoi and Olivier Giroud during the week, the performances that gave us drive and direction saw all three relegated to the bench in favour of the least effective midfield three we have had in decades. Sarri is a nice man, he could probably, eventually, get a team to play his style of football but by then the Premier League will have moved on and we will have to count the years of rebuilding and drift in the same way denizens of N5 have in recent years. A coach who cannot see his best team, effective tactics, or make any difference when we are struggling is a waste of space. Ji So-Yun’s sublime turn and finish in a tight spot saved our blushes in the FA Cup as Durham did everything they could to beat us. They had good chances too but there was always the feeling that we could go up a gear if needed. Monday morning for the semi-final draw. Previous articleHas Maurizio Sarri Now Entered Survival Mode?